This is fun... 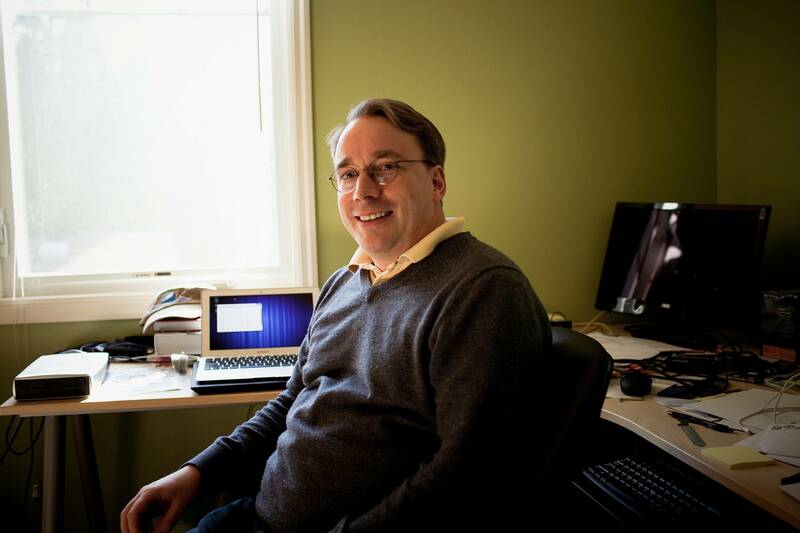 I'm fairly certain that the guess by this redditor about what you can see sitting behind the laptop in this photo (taken by John Snyder, and used in the 21 Feb 2012 Wired article, Lord of the Files: How GitHub Tamed Free Software (And More)) is correct. Probably, it's the copy I gave Linus last year. It's nice to know he held on to it, though I'm not so sure there's so much in the book that he doesn't already know. Updated 2015-07-06: fix a broken URL, and add the title of Wired article. Updates 2016-07-25: fix a broken URL (again... Wired.com doesn't seem to embrace the notion of stable URLs). Indeed, TLPI copy without any doubt. Even if it is written from userspace PoV, it is still the most elaborate and useful book about interfaces provided and exposed by Linux kernel to its users, i.e. applications (kernel w/o applications isn't that useful after all). Thus it's obvious that Linus has it somewhere within reach of his hand.